Super Meat Boy's cube of meat will soon be replaced by a character not made of meat, but still made of cubes. Super Meat Boy was recently released on XBLA (on sale no less), but is also planned for future release on WiiWare and the PC. While XBLA players will get exclusive free DLC in the coming months, Team Meat is also planning to add extras to other versions of the game, including the recently revealed main character from Minecraft. Team Meat openly asked Minecraft developer Notch on Twitter if it could have permission to use the blocky Minecraft man in the PC version of Super Meat Boy. 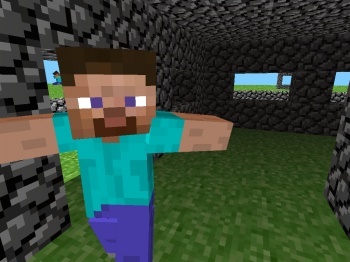 Notch gave the team the go ahead, and even said he wants to add "meat blocks" into Minecraft. They'd be perfect for the construction of a gigantic hamburger. Minecraft man might not be able to leap fifty feet over a buzzsaw like Super Meat Boy, but he can build a lot of cool stuff. Team Meat says it plans to create sets of levels specifically designed around special characters and their abilities, so Minecraft man's would presumably involve building in some way. The PC and WiiWare versions of Super Meat Boy do not yet have a release date. If you've already purchased Super Meat Boy on XBLA, Team Meat also tweeted about an incoming patch that should fix an auto-save glitch. The game apparently isn't saving when you replay a level and collect the same band-aid twice. However, exiting out to the map apparently fixes it for now. The issue should be patched "soon."